The cork and rubber underlayment is 3 mm in thickness and is 15 meters long. The color of the underlayment is wooden and the material is polyurethane, cork, and recycled rubber. The cork and rubber underlayment is installed underneath various kinds of flooring for noise reduction. The underlayment is weather-resistant for use in different environments and is durably constructed out of moisture-resistant material. 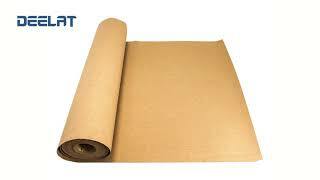 The cork and rubber underlayment is ideal for noise reduction in residential, commercial or industrial applications.